A museum visit and more in the city's most photogenic district. With my last OU assignment handed in (now only the exam to go) and my foot steadily getting better (more on that another time), I decided it was high time for another outing into central Paris. 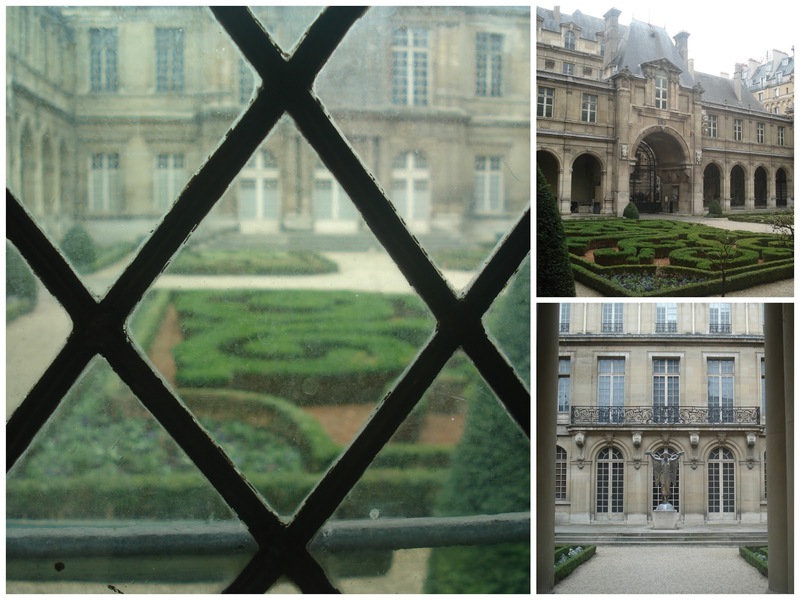 I chose Musee Carnavalet, mostly on the basis that I hadn't been before and the permanent collections are free year-round (it's one of the City of Paris museums). 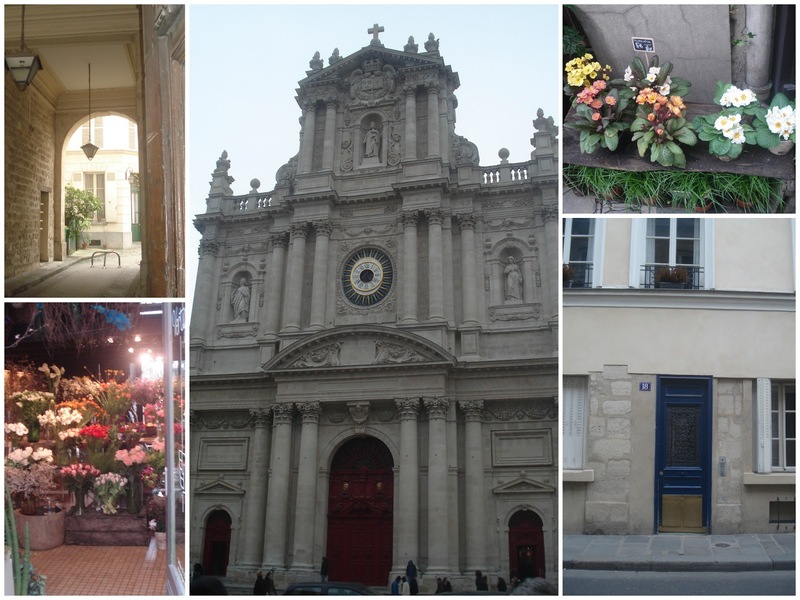 On the walk over from Saint-Paul (Le Marais) metro station, our favorite sights were Saint-Paul Saint-Louis church (17th century), a flower shop, and a little passageway. 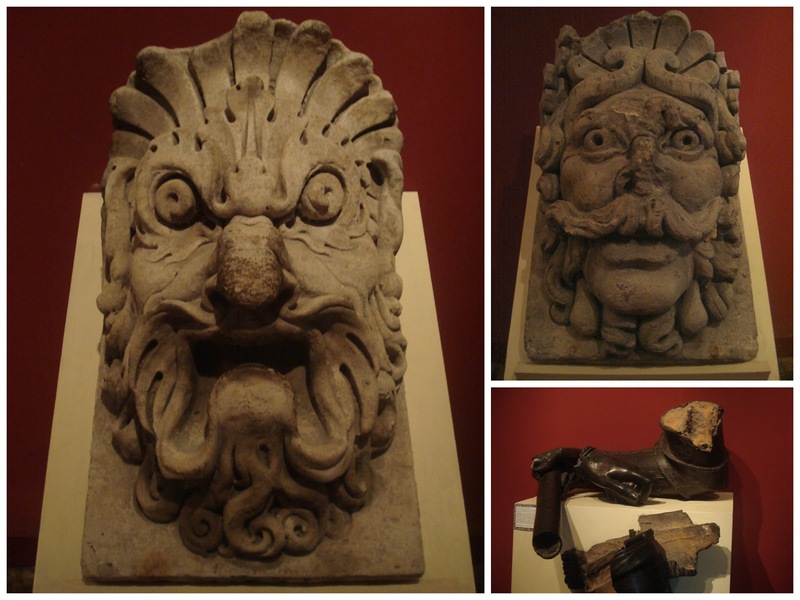 At the museum itself, we started off with the Paris in the 16th century wing. T was entranced by the large-scale model of Ile-de-la-Cite; I liked the Van Cleve portrait of Francois I and the Pont-Neuf mascarons. Also pictured: parts of an equestrian statue. T didn't care for the garden, but I liked it - it must be gorgeous in the summer. We then went to the Gallery of Signs (Paris streetsigns from four centuries), which included the somewhat-cliched Chat noir Cabaret sign, and Paris in the 18th century (mostly recreated period rooms). A note on bringing kids to the museum: it's probably best in small doses. On the ground floor, all the objects had little "don't sit on me / don't touch" placards - T's just old enough to understand and to control her natural impulse to get a tactile grip on the world, but I think it would be pretty hard for younger kids. On the top floor, it's mostly roped off - which again could be challenging for littler 'uns who have no compunctions about climbing under ropes. We left the museum after a good hour and a bit, but I plan to come back for the rest, especially prehistoric, medieval, and revolutionary Paris. 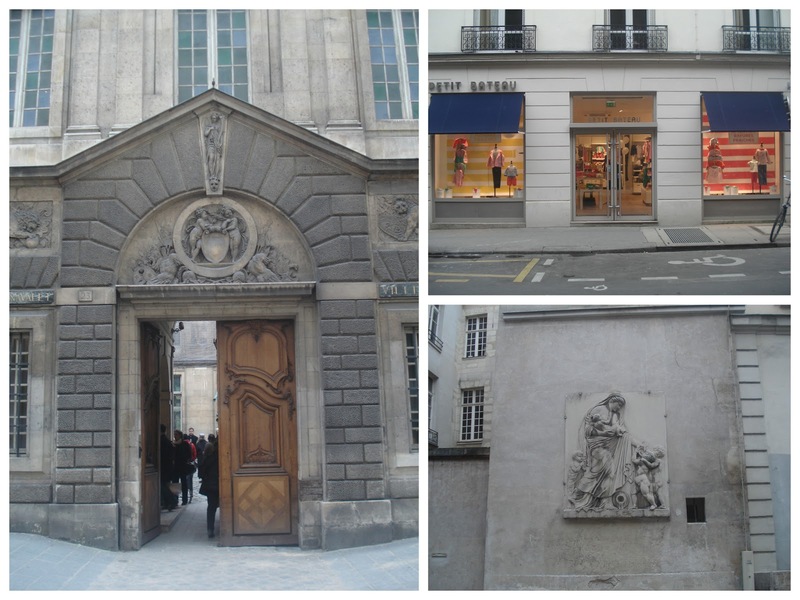 After the museum, we walked a loop to explore le Marais some more. It's very picturesque, with hardly a modern building in sight, and lots of art galleries and small boutiques (both independents and chains). 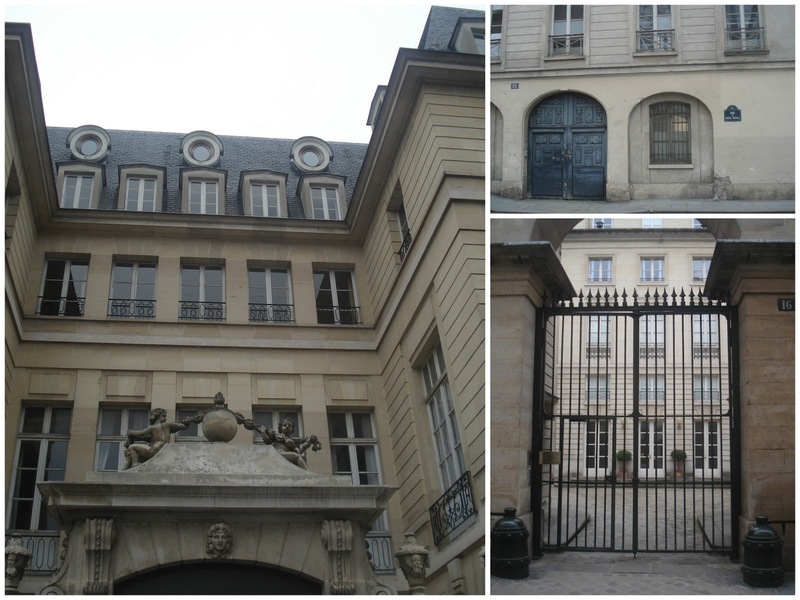 ...Rue Elzevir, Rue des Francs-Bourgeois, Rue Payenne, and then Rue Malher back to the station. 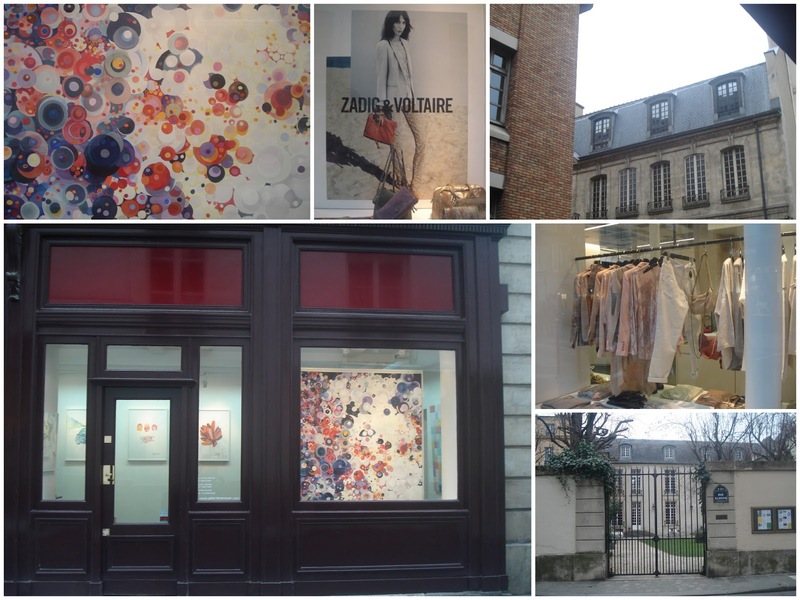 Circle painting at Galerie Menouar; parts of the new collection at Zadig & Voltaire; and the gate to a building I currently don't have the energy for to look up. The puppet store (Marionnettes du Marais) is incredibly appealing, with a cute window display featuring favorites like the three little pigs and Little Red Riding Hood (including a wolf in grandma's clothing). T charmed me into getting her a little rabbit (he's hidden away now and will return with the Easter Bunny). 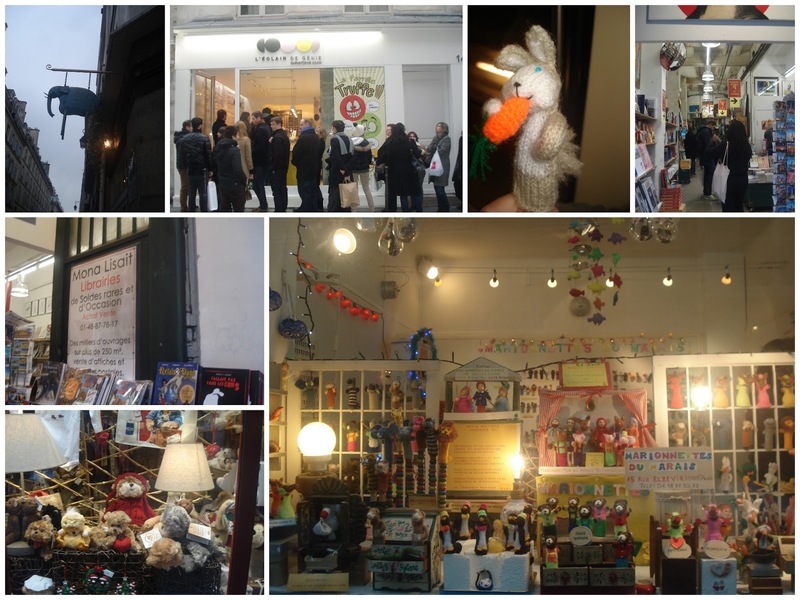 She also liked the teddy store L'ours du Marais (already closed when we reached it - fortunately); and we perused wholesale book store Mona Lisait. I like the look of the bookstore's guided tour to the hidden parts of Marais (in June). We headed home when the shops closed and it started drizzling - but we'll be back.